2010 1.6 i30 CRDI comfort. So to clarify by "cold" start, I mean any time the engine has been sat long enough to cool down from operating temperature and sat for a few hours. It runs rough for about 20-30 seconds and then the smoke and rough idle clears, however often hesitates and bucks for a few minutes when I start driving, and then runs normally until it's left to cool down again. The issue is intermittent and doesn't happen every time, there has been the odd time when I've started the car and it's been near flawless, but I can't seem to pinpoint a pattern. - 3 brand new injectors. The 4th injector had been replaced before and was "nearly new" so it wasn't replaced this time. There are no DTCs and no engine management warning lights. They've basically said they'll pay to fix the issue whatever it is, because they like their reputation and a happy customer is more important than the money lost on a car. The problem is, noone can seem to pinpoint the issue. If the issue can't be fixed I'll get a full refund no matter what, but I really do like the car. I've been given carte blanche by the dealer to take it to any garage I see fit in an attempt to fix the problem, but somewhere else to start would be best. If anyone has any ideas or experience with something similar, I'm all ears. I've tried searching for the issue but the usual culprits seem to have already been tried on mine. Maybe time to take it to someone else. Bad glow plugs or faulty glowplug cct would be most likely I would think. Is the glowplug fuse good? 80 amp I think. Well that's the thing, I've been given carte blanche by the dealership owner because he wants me to be happy, and I can take it to any garage I see fit and he'll pay for it. I'm just trying to arm myself with some more info. 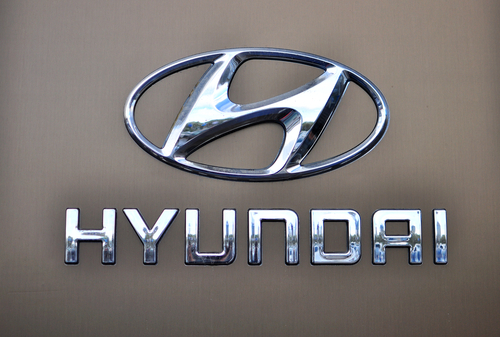 I said I'd avoid the hyundai dealership if I can help it, but he said if that's what it takes then so be it. The glowplugs and control module were changed not two weeks ago to try to rectify this issue. Is it possible their mechanic didn't check the fuse...? Wouldn't that register a DTC? It looks and sounds like classic No Glow for a no go to me. As much as I want to accept this dealer is genuine I have to wonder , replacing 3 injectors? They are very expensive new. You'd want to be sure. But it sounds like it's on 2 or 3cyl then when the smoke goes is that at idle and on all 4 after warmup? And then you say it's perfect. Long Crank Before Start - 2011 1.6 CRDI - Suggestions? (Disconnect the water temperature sensor connector). Reconnect the water temperature sensor connector after inspection. 1. Connect voltmeter between glow plug plate and plug body (ground). 2. Check indicated value on voltmeter with ignition switch ON. Continuity time varies depending upon cooling water temperature. 4. After checking 3, set ignition switch at START position. 6. 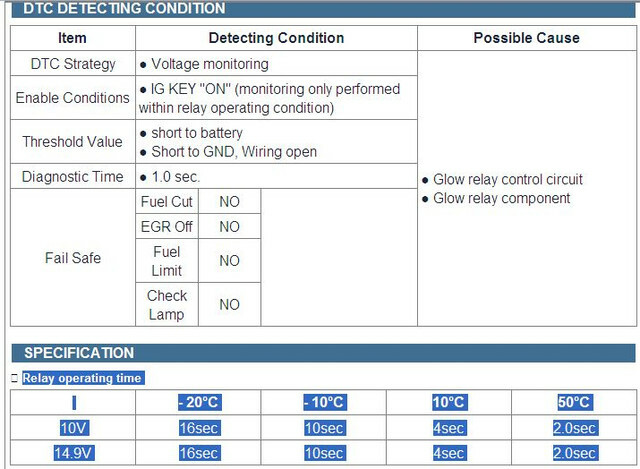 When the voltage or continuity time is not normal, check the terminal voltage in glow control unit, and single parts. GLOW PLUG1. Check the continuity between the terminal and body as illustrated. Replace if discontinuity or with large resistance. Remove oil from plug before measuring as glowplug resistance is very small. 2. Check for rust on glow plug plate. 3. Check glow plug for damage. 1. Remove the glow plug relay. 2. Inspect the relay continuity. A. 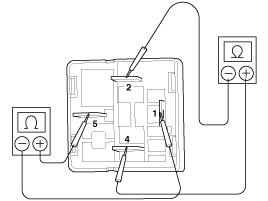 Using an ohmmeter, check that there is continuity between terminals 2 and 4. If there is no continuity, replace the relay. B. Check that there is no continuity between terminals 1 and 5. If there is continuity, replace the relay. 3. Inspect the relay operation. A. 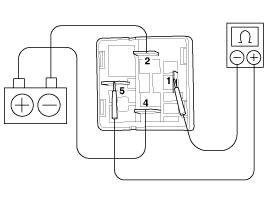 Apply battery positive voltage across terminals 2 and 4. B. 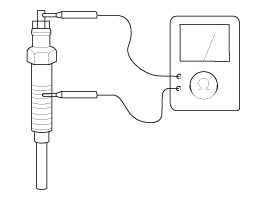 Using an ohmmeter, check that there is continuity between terminals 1 and 5. 4. Install the glow plug relay. 2)no current is detected like open or short to ground in glow relay control circuit for more than 1 sec. at glow relay ON condition. 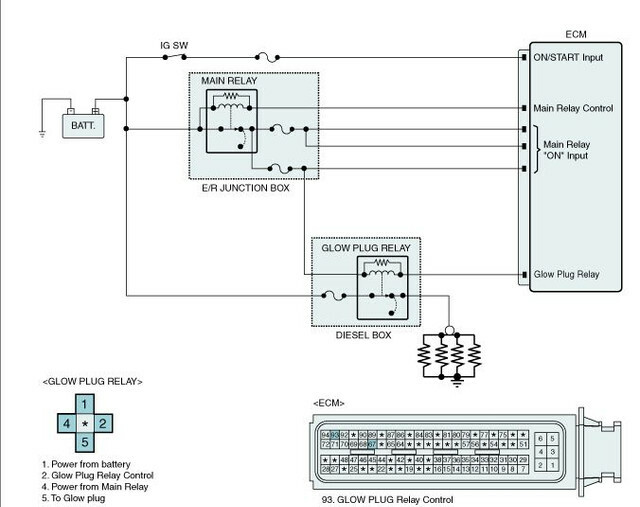 This code is due to open in glow relay control circuit or internal open in glow relay component. Glow plug relay and also note 80 amp fusible link. We've also had reports of the glow plug plate being bent accidently and earthing out on the head. Thanks for the invite Gerard, been chilling out, its Sunday do you have a life? @courtartanis my mate tw is covering all the areas I would. Your vid demonstrates poor ignition due to glow plug failure. 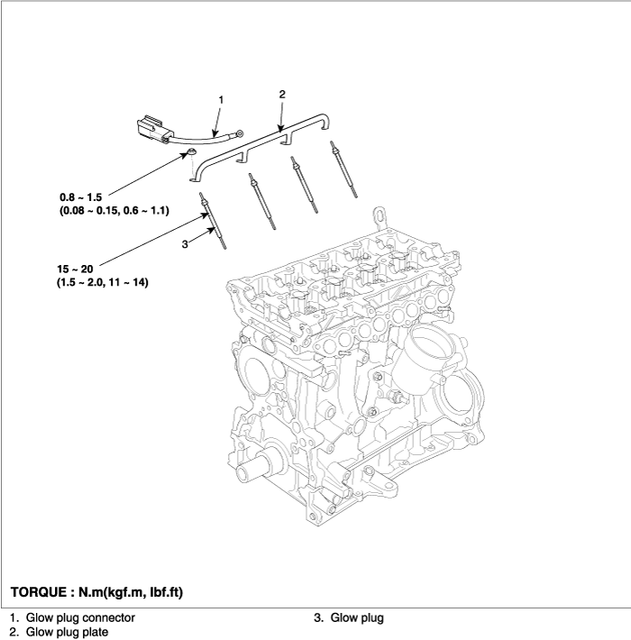 I would want to explore the glow plug issue further. First check that you DO have voltage at all the plugs at start. I recently used Polish glow plugs that I thought were not that great, so I wonder if your replacements are cheap and not functioning properly? A small bit of oil in the turbo system is normal, so ignore. Why did they previously replace #4 injector? Let me think on this overnight, but will probably still be suggesting glow plugs, same as tw. 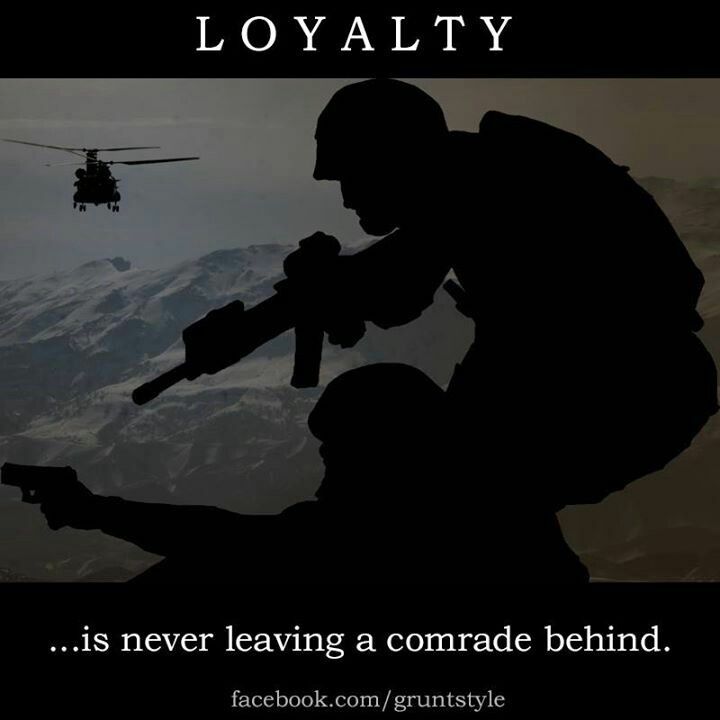 Committed to the cause my dear comrade. Thanks for the great info, I've printed @tw2005 response for test procedure. I've asked for a parts list from the dealer of which glowplugs + control module were fitted, but I'm going to take a shot at @nzenigma reply and assume inferior glowplugs for now, as I don't have a multimeter to hand so I can't test impedence or continuity. I did, however, just cycle the glowplugs 4 times and the engine started perfectly and the throttle response was gnat's wotsit fine. I used to work at a diesel specialist many years ago and learnt a few things, one of those things told me constantly that this is still a glowplug issue, but I never thought anything of it. The parts were replaced, so I was naive enough to just assume they were the right parts. Will let the engine cool down and repeat procedure to confirm. The dealer definitely replaced 3 injectors with new, as I watched the mechanic do it. The dealer's owner may be out of his depth here, but he's a good guy. His mechanic, however, obviously keeps overlooking something. The 4th injector, not sure about that one, it may have been replaced before they even got hold of the car. But, it's definitely newer than the manky old OEM ones that were removed for the new ones. Not sure which glow is correct as there appears to be a few types in the European market. This is my 5am thought bubble > head gasket. Has anyone done a coolant pressure test? If you have a small leak into one or two cylinders you will get the symptoms displayed in your video. 4. fault is still present . Now if we assume that the voltage at the glow plugs was checked and is correct we can say that there is only a remote chance that a good quality, new component is also faulty. Recheck the circuit and voltage. Then I would be looking elsewhere . A coolant leak , if it exists, could be due to a crack or corrosion in the head or gasket failure. Even if the pressure test does not reveal a small leak, I would like to look inside. Best I have at this stage, good luck. I'm confident myself at this point that it's still glowplugs because cycling them several times and extending the preheat eliminates the issue. Edit: Just reproduced this solution for a 3rd time, but there's still time for me to be proved wrong I guess.. Speaking of which, don't these have intake pre-heaters as well? Would a faulty preheater have any effect on the issue? I think so, Essentially the "prime" is only glow plugs, on the i30 diesel there is no fuel pump in the tank. Haven't had the air heater checked and there's no DTC for it, but it'll be on the list if it's necessary. Had the plugs tested today, all 4 (fitted new, NGK) plugs are within spec and tested outside the block. They reach required glowyness within 3 seconds or so. The relay is working as it should and all 4 plugs are being powered for 20+ secs with ignition on, then up to 2 minutes or so after starting the engine. Glowplug plate is pretty clean tbh and free from corrosion. I forgot to ask whether the coolant temperature sensor was unplugged, even though I was standing right there watching lol. The figures are probably lower because the engine was warm-ish in that case. The plugs are fine, the relay seems to be doing what it should. Glow light does switch off pretty quickly (1-2 secs), which is not enough for a clean start, but leaving ignition in ON position for an extended time after the light goes off (without having to cycle) is enough to get a clean start. That leaves the control module, which after double checking today was not actually replaced, that was a miscommunication. The current theory is that I'm just being tricked by a glow light not staying on for as long as it should. Control module is the next thing to replace. Mate, I think your guys have one oar in the water and are stuck in the glow plug pond. Think laterally. Are the UK Summer and Autumn temperatures really as bad as we like to believe them to be down here? Essentially, we can start a crdi without needing glow plugs during the day. First start on Winter mornings, it is more difficult but not impossible. Your video appears to demonstrate 2 or 3 functioning cylinders with the 4th finally becoming fully operational. Have they considered the head leak I proposed? I haven't mentioned it, because why would the engine start perfectly with an extra few seconds of glow if it had a head leak? Not only that, but I've had the car over 6 weeks now and the coolant level hasn't changed a hair. Unless you're suggesting a really really REALLY small head leak, which shouldn't cause a cylinder to misfire more than a couple of times. I can leave the engine to cool for say, 4 or 5 hours, and the fault will appear... but if enough coolant is leaking into a cylinder in that time I'd notice a drop in coolant over time surely? I appreciate the suggestion, but it seems like such a long shot I'm sceptical of it..
For what it's worth @nzenigma , I'll mention it to the mechanic or maybe pull the glowplugs and scope it myself. If it yields results I'll buy you a beer for such a wild longshot, but if not I suppose I can say it's been eliminated. I haven't mentioned it, because why would the engine start perfectly with an extra few seconds of glow if it had a head leak? Not only that, but I've had the car over 6 weeks now and the coolant level hasn't changed a hair lol. Unless you're suggesting a really really REALLY small head leak, which wouldn't cause a cylinder to misfire. You seem to miss the point that Gerard and I work from a disadvantaged position, irrespective of the perceived advantages of, and the miracle of, the inter-web; we do not have your vehicle to physically work on or assess. Your advantaged mechanics are persisting with glow plug performance, and not finding a fault. This is not exactly rocket science. Diesel motors have had glow plugs for decades. A multimeter will confirm the time that they are functioning during start. Simply apply the metre , leave it attached and check at each start. What is does not seem apparent to your experts is that this same function is used periodically to balance environmental requirements while driving. This is confusing them. One for free, would YOU be sceptical about intermittent low rail pressure? I didn't mean to say anything to imply I'm ungrateful of your advice (despite your disadvantaged position). If you think that I should still consider a head leak despite the caveats I described, then I'll happily concede and try it. If I start the engine as soon as the GP light switches off, I get the problem in the video. If I wait an extra 2-3 seconds after the GP light switches off, then start the engine, I get a perfect start with no smoke and no rough idle. Is me waiting an extra 2-3 seconds with ignition on before starting likely to rectify a fuel rail pressure issue? I'm not so sceptical about that, which is why I suggested fuel system a few posts ago, but I didn't know if by leaving the ignition on with this engine I'm re-priming it with those extra seconds. It runs rough for about 20-30 seconds and then the smoke and rough idle clears, however often hesitates and bucks for a few minutes when I start driving, and then runs normally until it's left to cool down again. The glow plugs will remain active for a period after the dash light goes out. while you didn't feel the 'possible' water leak was worthy of comment, nor were questions about new injectors answered. 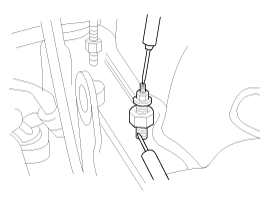 Correct function of the injectors is dependant upon sufficient fuel rail pressure which is in turn dependant upon a mechanical pump controlled by electronic devices. 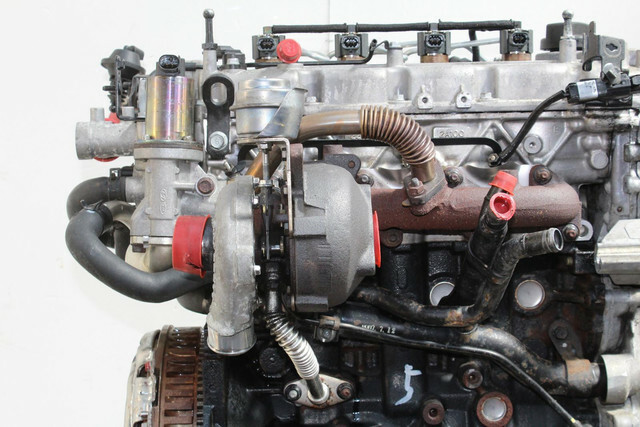 Much of the modern crdi engine's efficiency and ease of starting is due to the extreme pressure applied at the injectors. The dealer definitely replaced 3 injectors with new, as I watched the mechanic do it. I'm as sure as I can be about the injectors. I watched the mechanic unbox them and fit them, I even saw the parts invoice. I could get the 4th injector tested, but it can't be anymore than 10,000mi old judging by the looks of it. You may have just missed the info because it was buried in replies or perhaps I worded it a bit wrong? Extending the preglow gives a clean start. I'm assuming that if it were low fuel pressure, or a water leak, then extending the preglow interval before I started the engine wouldn't do anything to help the issue. mate I should make the point that it is easy to miss parts of, or misinterpret, lengthy threads. Both tw2005 and I have full time jobs and we also contribute here in our spare time. Just scroll through the current threads , its too much for two people to keep up with, but occasionally we do manage sleep. Your mechanics could have easily established this and provided a guide for you when you were away from the workshop, by simply connecting a 12v bulb to the gp rail and taping it to your dash. As mentioned there is no fuel pump in the fuel tank so unlike the petrol motor, the i30 diesel system relies upon an already charged fuel line going to a High pressure pump on the motor . The system needs to run at an extremely high pressure. If the electronic control valve on the pump is not functioning immediately, then you will have poor or nil combustion. This is just one suggestion. As mentioned we are not hands on to your vehicle, we rely upon your mechanics to work through this methodically and to accept or eliminate issues that may be causing malfunction.